A recent article in Nature Communications discloses a new methodology to install stereocentres precisely at the gamma-position of (bioactive) amines. Nitrogen-containing molecules are ubiquitous in Nature and, remarkably, nitrogen constitutes about 3% of human body by mass, being the fourth most abundant element after carbon, oxygen, and hydrogen. Nitrogen is found in several classes of organic compounds, such as amines, and chiral amines, particularly, have played a crucial role in determining the origin of life as we know it (just think of aminoacids, peptides and nucleotides). This is only the beginning of this nitrogen story , what if I say nicotine, codeine, cinacalcet, sertraline? All of these names are known not only to chemists but also to non-chemists due to the extensive use of such chemicals in our society. 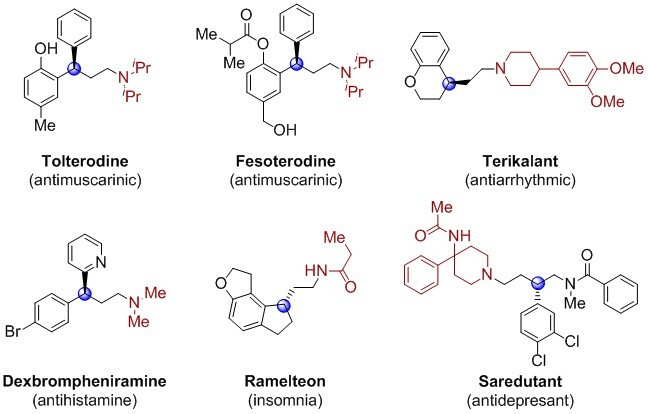 Interestingly, these compounds have common aspects : they are all amines that possess a chiral centre at variable positions in their backbone with respect to the nitrogen atom. Therefore the correct absolute configuration is essential for their biological activity. Synthetic chemists are well versed in installing chiral centres at a carbon adjacent to the nitrogen atom of an amine and a pool of methodologies to create alpha-chiral amines is now well established. Nevertheless, the development of general strategies to introduce a stereocentre (chiral centre) at remote carbons with precise site-selectivity and high enantioselectivity is more challenging. In this context, direct access to enantiopure γ-branched amines, which are targeted by the pharmaceutical industry (fig. 1), would greatly aid synthetic chemists in establishing new, simpler routes to valuable drugs. Building on a previous work on the direct asymmetric synthesis of β-branched amides, Hull and coworkers have devised a new methodology that allows for the highly enantioselective direct construction of γ-branched amines in one-pot from readily available allylic diethylamines and a wide scope of exogenous amine nucleophiles. The two proposed steps, enantioselective isomerization and enamine hydrogen transfer (fig 2), both known separately, are precisely coupled in the present work to achieve an elegant one-pot reductive amination process. The first step, namely the formation of a tertiary stereocentre with a rhodium/Binap catalytic system, was successfully realized in their previous oxidative protocol to obtain amides, however some important challenges are associated with the envisaged reductive amination process. Firstly, the starting materials and the intermediate chiral enamine might be reduced before the enamine exchange takes place, therefore the choice of the amine starting material is crucial. The choice of the hydrogen donor for the second step is not trivial either in order to achieve high chemoselectivity, as demonstrated by the optimization studies. Although Buchwald et al. have reported earlier a direct approach to amines with remote stereocentres (doi:10.1038/nchem.2418), Hull et al. now show a system operating with high activity, chemoselectivity and enantioselectivity for a broad range of substrates. The production of diverse γ-branched amines takes place in good yields at temperatures slightly higher than ambient temperature (40-60 °C), with negligible formation of side products and with enantiomeric excess values that are attractive to any pharmaceutical process. Remarkably, the two-step synthesis of marketed drugs Terikalant or Tolterdine (both shown in figure 1) in high yields (75% and 88%, respectively) and enantioselectivity (93% and 92% enantiomeric excess, respectively) clearly demonstrated the synthetic utility and potential of the current report for both academic and industrial researchers. Overall, this work demonstrates that simple new concepts can nicely expand the current portfolio of available synthetic methods and will stimulate other chemists to explore challenging targets such as the controlled formation of remote stereocentres.